Operating out of Hong Kong offers many places to visit rather easily in Asia. Since funds were not unlimited we decided upon Hanoi since it was a less than 2 hour flight and were able to work a deal through ‘Last minute travel deals’ out of HK which included airfare and two nights at the Fortuna Hotel in Hanoi. It was an experience my friend and I will not soon forget. I’ve some friends back home who have already been to Hanoi with their families. All told me it was an interesting place and even made some recommendations on what we should do. However I was not completely prepared for the cacophony and tumult that is Hanoi. The notion of visiting Hanoi as a tourist destination was unthinkable 35 years ago at the close of the Vietnam War. 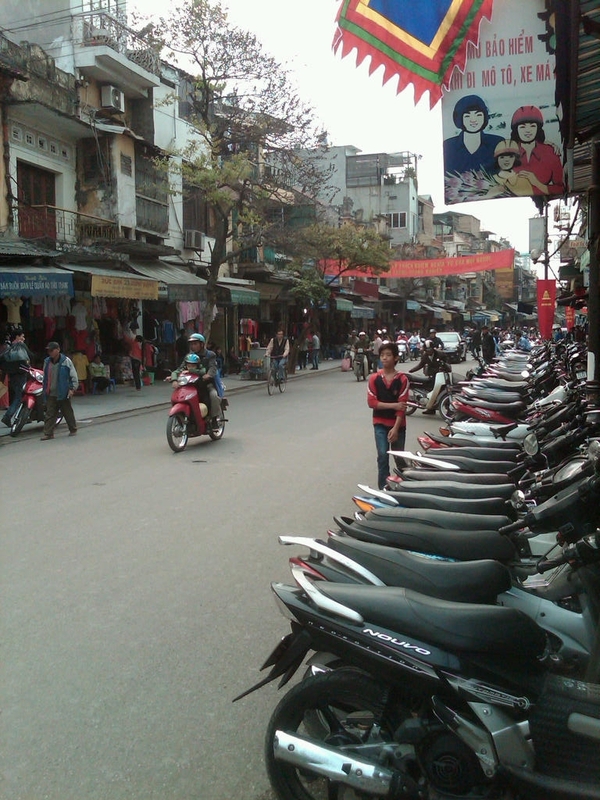 Today Hanoi is thought of as an up and coming city. That is true in a comparative sense but it still has a way to go to be a tourist destination that would appeal to substantial numbers. Westerners in particular. The late night trip (we arrived at 11:30PM a bit late but close on HK Airways) from the airport to the hotel was a serpentine run around a great deal of construction going on, cars stopped in the middle of the road, slow-moving vehicles and boarded up houses. It was dusty and the ride took almost 45 minutes. Nearly everything closes down in Hanoi before midnight. The socialist party must feel it is best this way. Our hotel itself was relatively nice in view of the surrounding area. Catering to a bit of a more well-heeled crowd it contained both a nightclub and a casino (that catered only to foreigners – no Vietnamese allowed was the sign posted outside). We elected to pass on trying our luck in the casino. Saturday morning we were up early and we had a nice breakfast (included) in the hotel complete with a pretty good omelet and I had a bowl of Pho (local brothy noodle soup). I actually did not order it and I think it was destined for another guest but as this was a buffet I decided to eat it and was glad I did. We took a taxi into the old quarter and the march of the motor scooters was in evidence. Hanoi has more motor scooters than I have ever seen in my entire life combined. People travel by scooter often with small children (even infants) either behind or (worse) in front on the handlebars. Traffic is non-stop and walking across the gauntlet was daunting at first as we felt we had to be hit eventually but somehow the drivers managed to veer around us making us feel like pedestrian scooter matadors. By the end of the day we paid little mind to the scooter parade. But it still was a remarkable sight. While we were having coffee at a place recommended on ‘Lonely Planet’ we noticed a couple emerging from a car in full bridal gown and suit. Apparently weddings begin early and we noticed that after a short while the bride (who was pregnant, but we did not see any shotguns) and groom came out and went down the street to another location where the reception was to be held. We took in the ‘famous’ Hanoi Water Puppet Show (front row seats for $ 3.00 U.S.) that traced the history of Vietnam and was done with music, singing from the side ‘band’ to complement the puppets. Maybe it was the beer from lunch but we did manage to snooze for a couple of minutes which actually was quite relaxing. At about 19,000 Vietnamese Dong per dollar buying things is cheap in Vietnam. It does put you off when a meal costs 200,000 dong until you realize that’s about $ 11. And you get a lot for your money. Local ‘Legend’ Beer, Fresh spring rolls, and of course more Pho – the food is excellent. 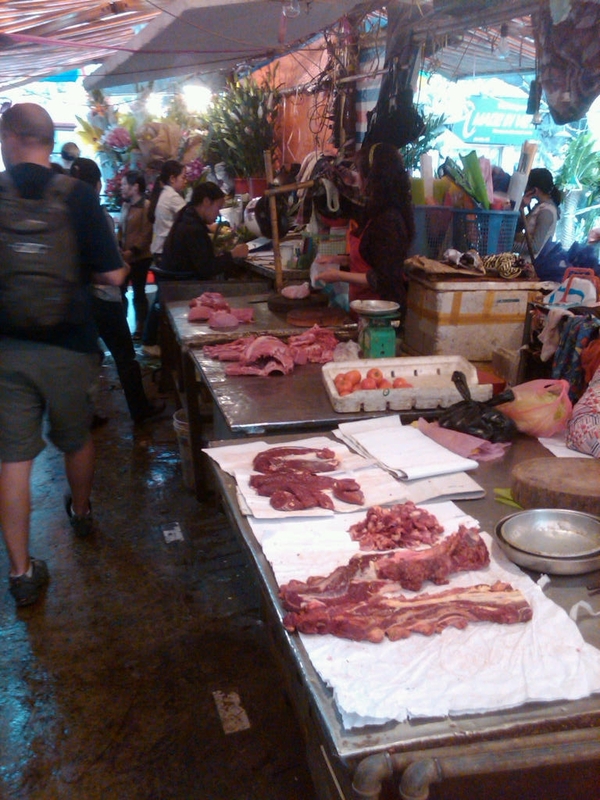 We toured the market outdoor which was interesting but convinced us to shy away from street food. Goods are also inexpensive and each had a 60 minute full-body massage (get your heads out of the gutter folks this was totally legit). $ 6.00 each plus tip. When we decided to return to the hotel that evening we hailed a taxi (also cheap) and were treated to a somewhat harrowing ride from a maniacal taxi driver. Saturday night in Hanoi is cruising night and the throngs of scooters, cars and taxis was something we will never forget. At one point the driver bumped a scooter in front of us and cackled ‘motor scooter, motor scooter’, he then stuck his head out the window yelling something in Vietnamese that seemed to scare the scooter rider off. I got the feeling that the days of the week do not matter much in Hanoi. People work to live. And that was one of the most refreshing things about Hanoi. Despite their Spartan lifestyle the Vietnamese smile often (in contrast to the Chinese I’ve seen in Hong Kong) and appear willing to help in any way they are able. We could all learn a few lessons there. This entry was posted in Customer Experiences, Living in the World Today and tagged Fortuna Hotel, Hanoi, HK Airways, Last minute travel deals, Legend Beer, Lonely Planet. Bookmark the permalink.